Oh, OK, I may not be a “real” tabby but I have tabby markings. 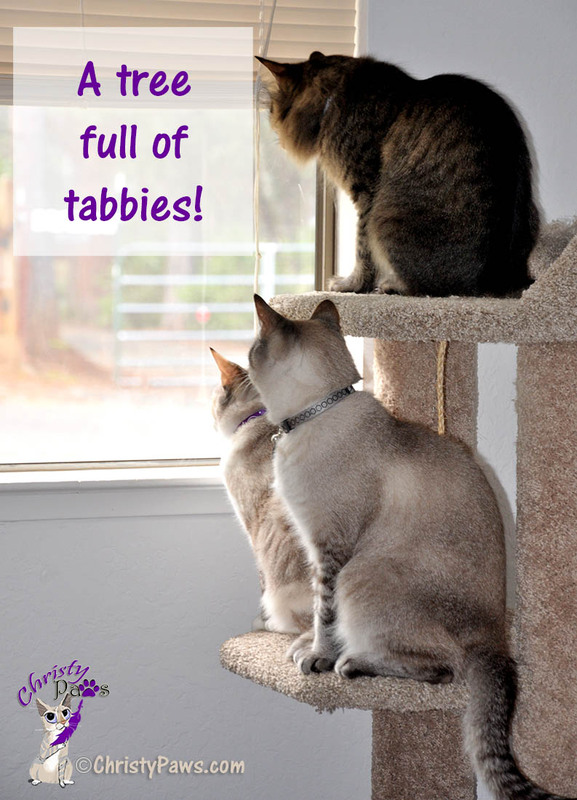 Actually, all three of us do and since today is National Tabby Day, I wanted to share our tabbiness with you. 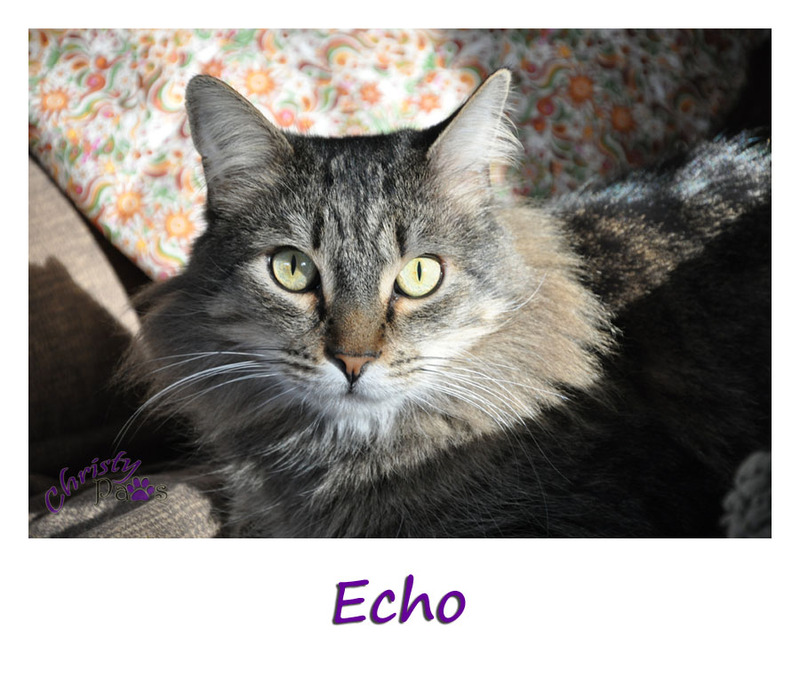 My brofur, Echo, is our “real” tabby. He has long fur so it is a little harder to see his stripes but he has the markings of the original, mackerel pattern. He has stripes on his sides that look like the bones in a fish. His are pretty broken and not solid like some. He also sports the double necklace and a fairly dark M on his forehead. He’s supposed to have a double row of vest buttons down his belly but you won’t find me looking for them! Mom says she can’t even find them in all his floof. Mom doesn’t have many photos of his body because she loves to photograph his beautiful face and eyes. 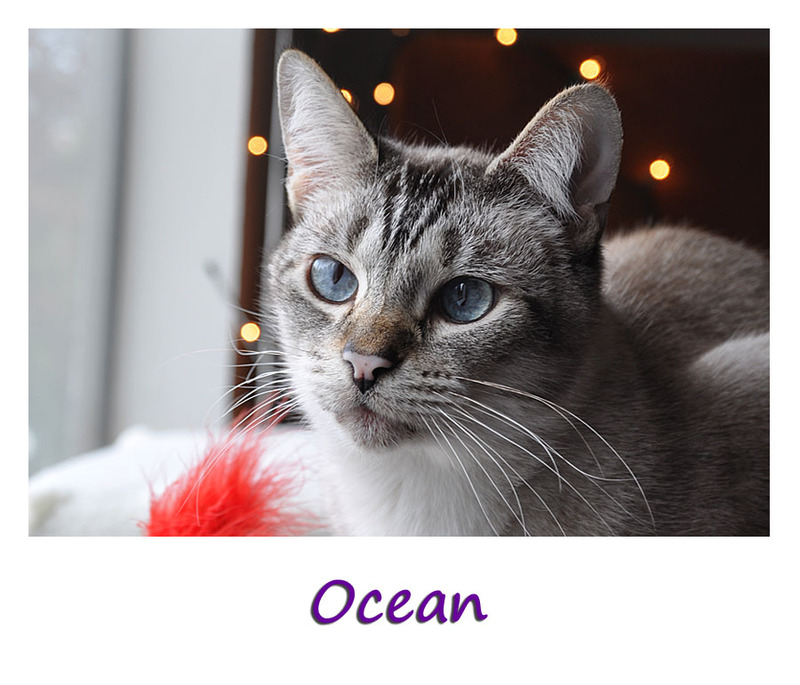 Ocean is a Siamese mix with what is called lynx points. 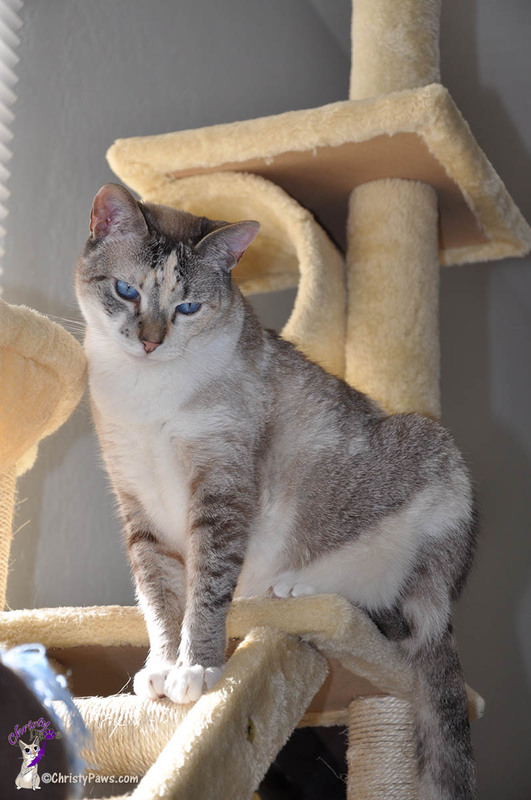 The lynx point Siamese came from an accidental mating of a pure bred, seal point Siamese with a tabby cat. An offspring from that litter was mated to another seal point Siamese resulting in the first seal point tabby. 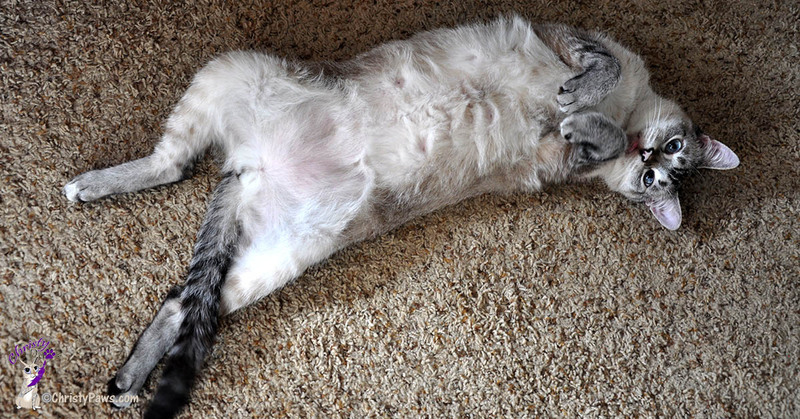 Ocean’s body has Siamese coloring but the points are tabby instead of solid. You can see the stripes on his tail and legs. 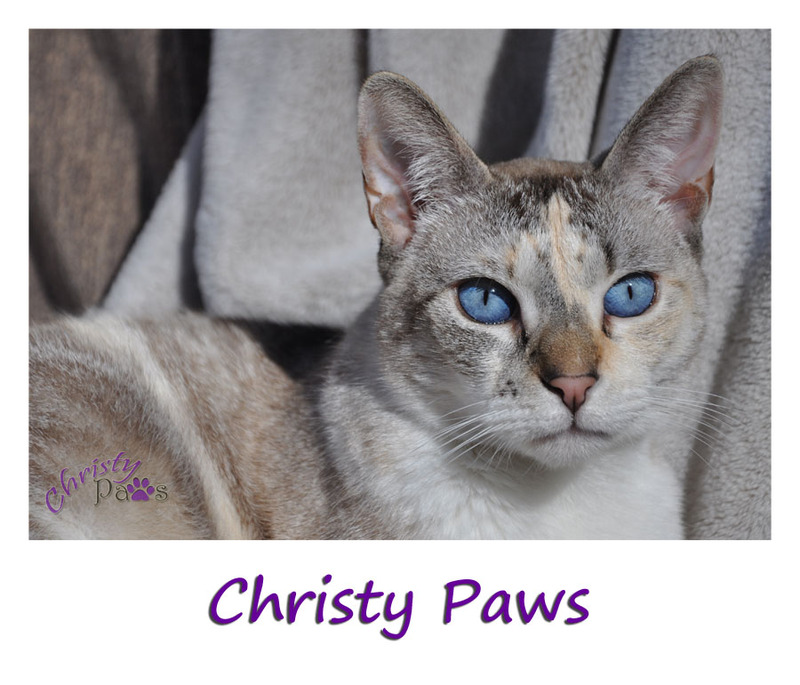 Most people associate blue eyes with Siamese cats but did you now there are lots of other breeds with blue eyes? The typical ones are Siamese, Ragdoll, Birman, Snowshoe, Tonkinese, Balinese, Thai cat (the traditional Siamese), Javanese, Turkish Van, Himalayan and Ojos Azules. Even more breeds can have blue eyes depending on their coat color. So, even though my blue eyes probably came from being part Siamese, it is not a given. You can see my tabby markings in my striped legs and tail. Here you can see more stripes in my body and I even have an M on my forehead. Cats with blotched coats of red and black are called tortoiseshell or tortie for short. If the blotches are striped they are called torbies. Since I have so much white, I’m really a calico and not a tortie. When the colors are faded out like mine, it is called dilute, so a light blotched, striped cat would be called a dilute torbie. Mom says I’m quite a conglomeration. My coloring is part dilute calico, part tabby and somewhere I got blue eyes. Oh, and I can’t forget my white feet that might mean I’m part snowshoe. That could also be the origin of my blue eyes. I don’t think my pattern or color has a name. I guess it doesn’t really matter. Mom says I’m beautiful and that’s all that matters to me. Do you have a tabby in your house? Do you have one with an unusual color like me? If so, I’d love to know about him or her. Tagged cat, cat photos, Christy, Echo, National Tabby Day, Ocean, tabby cat, tabby coat pattern. Bookmark the permalink. 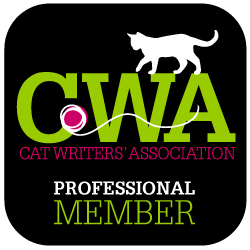 Concats on your BlogPaws nomination!!!! Waffles is a proud Mackerel Tabby! …with a big M on his forehead. Or W, depending on your perspective! 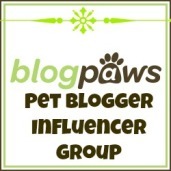 BIG Congratulations on being named a finalist for Best Blog Photo in the BlogPaws Nose to Nose Awards! Your entry is SO beautiful! We’re very honored to be sharing this category with you and wish you the best of luck! ???????????? Waffles is my favorite orange tabby! He is so goofy and funny. Thanks for the compliment on my Nose to Nose entry. Your photography is so pawsome and inspiring. Happy to be sharing with you. 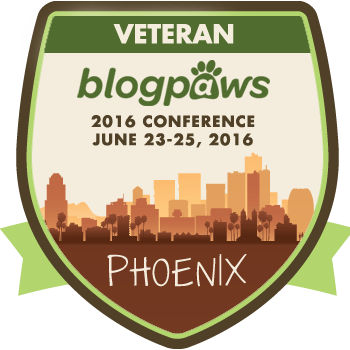 I look forward to meeting you at BlogPaws. I’m coming with mom this year! I consider any cat with tabby markings to be a tabby, so you make a great tabby in my book. 🙂 All of you have beautiful markings and I love your eyes. 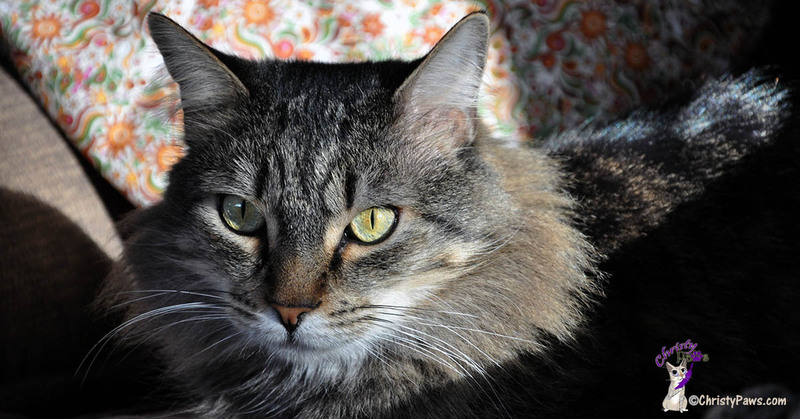 I do have a tabby at home- Manna is a classic tabby with beautiful dark brown swirls. 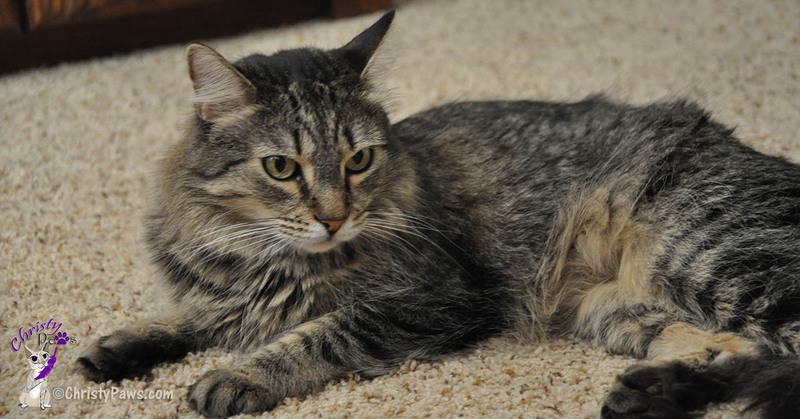 Manna is a gorgeous tabby! We love her and miss Cinco. I hope you all are remembering the happy times with him. You are beautiful tabbies!! I, of course, am a tuxie, but Tigger visits us a lot and he’s a tabby. He has (or did have before he got fat!) spots like a leopard! 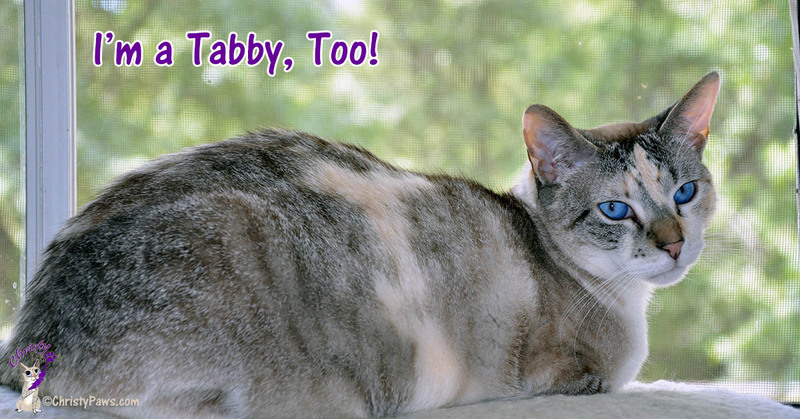 Yes indeed there’s tabby-ness in your household! I think all of you are beautiful with your coloring. Celebrating the first National Tabby Cat Day was a lot of fun……maybe you should join the Tabby Cat Club? We have fun there too! Me and Crockett are both tabbies! Happy Tabby Cat Day! I think you are all beautiful too whether or not you are a tabby. My Joanie is a dilute calico, but she has a few stripes so we are wondering if that counts to get into The Tabby Cat Club. You guys all count as tabbies, since you have the markings. Even I count as a tabby because my fur is called “ticked” tabby, with its bands of color on each strand. 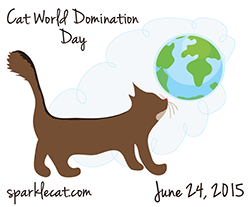 So – happy National Tabby Cat Day! Yep you are all tabby cats, and beautiful ones to boot! If you ever want to join, the Tabby Cat Club is always open to new members and we don’t expect much, you post and join in only if you want! (http://tabbycatclub.blogspot.com/). 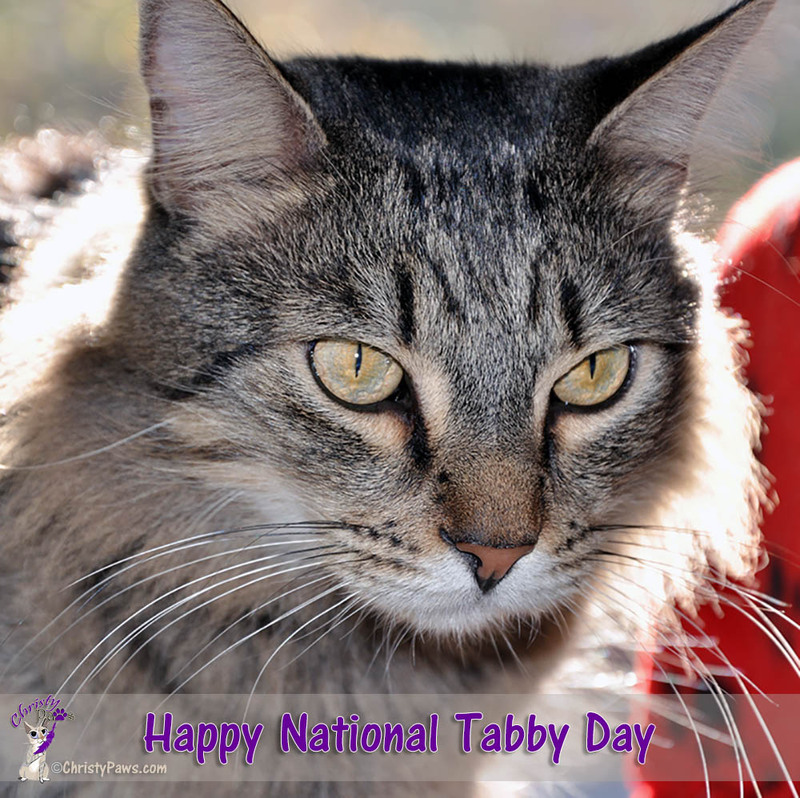 We are proud that we are all of the Tabby persuasion today! Happy Tabby Cat Day! 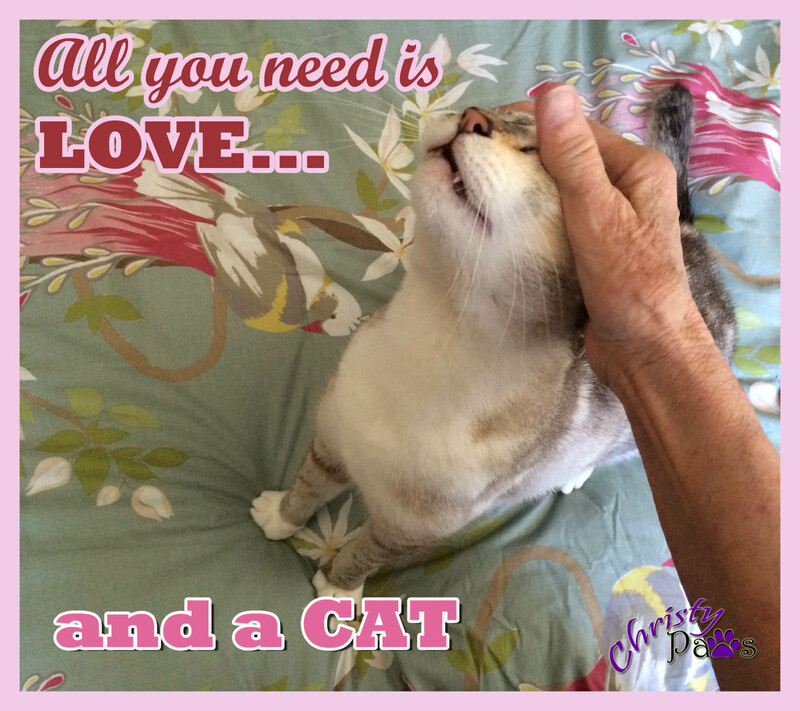 As long as you have Tabby markings (which you DO!) you are a “real” Tabby!!!! Happy National Tabby Day! Aw, thanks! Happy day to you all, too! Thanks, Kali! I’ve always admired your beautiful reddish fur. 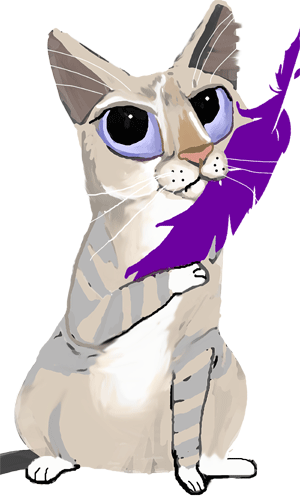 Interesting that you got some of the lynx point on your tail.